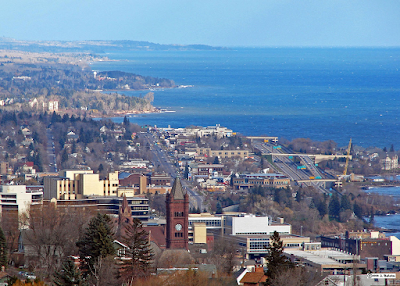 I'm one story behind (we were in northeastern Pennsylvania last weekend, and the city was so depressing I'm not even naming it), so let's talk about Duluth today. 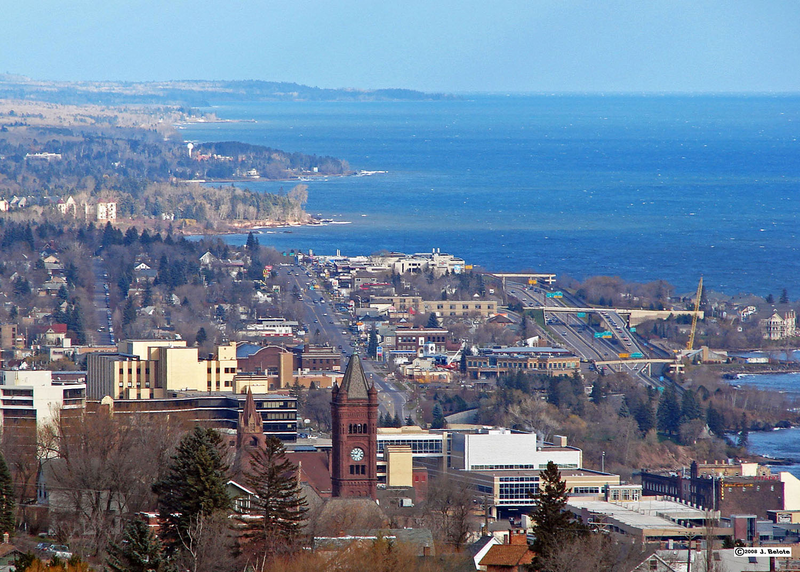 The most important thing to know about Duluth is that it's beautiful. Really, really beautiful. If you click on that to enlarge it, I'll show you a few things. First, the anchor point of any hockey trip--Jimmy John's--is in the lower center. That's where Eli took the missing photo that looks out over Lake Superior (that's an alpha name for a lake, to be sure). Now, find the crane over toward the center-right edge of the photo. If you look to the right edge from there, and go up just a tiny bit, you'll see a cluster of buildings. That's an apartment complex, right on the water. I don't even know how cold that building gets in winter, but I bet I don't want to be there. Everything is green (at least in summer). It's hilly in places. The water is beautiful. Oh, and the population. It's not big (85,000 roughly), but it's big enough. The people are quite a bit like people from Michigan. Very polite. Friendly. Helpful. People in Minnesota say "Have a nice day" like they actually care that you do. The rink was actually in Cloquet, not Duluth, and we stayed in a hotel that was in-between, about 15 minutes away from each. The hotel was right next to a ski resort (we're not talking Aspen, be realistic), and given the season, it was mostly empty. If you're wondering how far Duluth away is from, well, anything, it's about 150 miles away from Minneapolis. Once you leave Duluth, even a few miles out of town, the only mileage sign you'll see for the next two hours is for Minneapolis. So it's definitely isolated, but it doesn't feel backwards. Okay, that's the set up. Tomorrow: hockey, ski jumps, ticks, and Percy Fawcett.